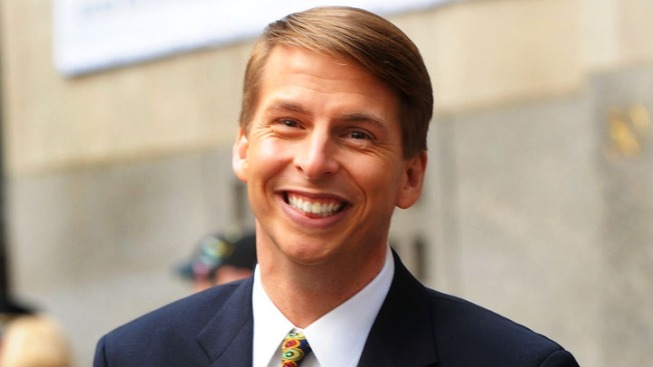 Actor Jack McBrayer lends his voice to the new animated film "Wreck-It-Ralph." Jack McBrayer may be putting on Disney’s Mickey Mouse ears for the moment, but he’s not quite ready to turn in his NBC page jacket. McBrayer’s in his seventh and final season on “30 Rock” in his Emmy-nominated role as the eternally cheery Kenneth Parcell, and he’s already on to a new quarter-powered life as the voice of the industrious video game hero Fix-It Felix in Disney’s animated adventure “Wreck-It Ralph.” The comic actor reveals his “30 Rock” separation anxiety, the long road to turning his oh-so-distinctive drawl into the secret of his success, and why (sorry NYC) his bags are already packed for Los Angeles. Who do we call to get a post-“30 Rock” Kenneth sitcom, like they did for Frasier after "Cheers"? Well, I think, it might be a very limited audience, sir. But who knows? I imagine they'll let me keep one of those page blazers, so I'll just start my own show. What's the typical reaction when fans recognize you in real life? I tell you what: It depends on where you are. People in New York a lot of times will say, ‘Kenneth,’ and people at bars who are drunk will get all up in my face and say, ‘You're that guy from ‘The Office!’ ‘No, no – NBC, but different show.’ But you go to Conyers, Georgia, and nobody there watches ‘30 Rock’, so they're like, “Ah, ‘Talladega Nights!’” So it just depends on what crowd you're in. Some of the younger, urban youth in New York are like oh, ‘Mariah Carey!’ because I was in a Mariah Carey video, so it depends on who you're asking. But the good news is most everybody is very kind when they come up. It's the drunk ones you've got to look out for. The last seven, eight years of your professional life have been pretty spectacular. How were things right before everything kind of locked into the place for you, and how did you deal with the big changes? I was very hungry right before things came into play. I got my start in Chicago doing Second City, which is where I met Tina Fey. So this is like from 1996 to when ‘30 Rock’ started in 2006, between living in Chicago doing Second City, moving to New York, doing the comedy scene there – Conan O'Brien was shooting his show there – and then I moved to Los Angeles. I was still temping and struggling. It was a solid decade. It was ten short years in the making before I finally got a break where I could eat three meals a day. But I was always happy to do the work because I knew what I wanted to do, and I was going to do whatever it took to get there. And now you’re on the farewell tour for “30 Rock” – Where are you guys in production right now? We're halfway through shooting them, but we've only got 13 episodes. Right now, it's like business as usual because you have to bring the episode together, but I think towards the end – fella, it's going to be hard! I'm just hoping that my last scene that we're shooting is so ridiculous or over the top or they're all so cranky that I'm not going to get emotional. What's been fun in the last season without giving away too many spoilers? One of my favorite episodes so far this season has been when we meet my mother and her friend, played by Catherine O’Hara and Bryan Cranston – phenomenal actors! And I think we've been playing so much with Kenneth's age, I don't even know if I'm a person really, but I think we're just blowing it all out of the water at this point. So I am as interested as you to see how this all ends up, but I know when it does, it's going to be hard. Are you planning on coming back to L.A. to look for a gig that's maybe based here? I think so. And with all due respect to New York, if I never see snow again, I will be a happy man. Fella, I'm done with it! It's like, ‘Oh, it's so beautiful!’ Nope – no, it ain't. “Wreck-It Ralph” looks like it must’ve been a lot of fun to make. I swear to God, I just recently saw it, and it looks amazing. You can only take so much credit as we are sitting here doing all these interviews and stuff. But when you see the finished product, you're like, ‘Oh, I did a very small portion of the work that goes into a movie like this.’ Just because hours and hours of labor and such specialized things like ‘I'm in charge of background.’ ‘I'm in charge of cocoa powder puff.’ Such talent, and I hope people recognize all the work that these unknown people have done. Did you see the character design before you put a voice to Fix-It Felix? No, not initially. We came to a table read, and they showed posters of what their inspirations were. And so for Fix-it Felix, Jr., there were all the 8-bit characters. I think it was Mario from Donkey Kong. So I kind of knew the guy I was playing, but of course, I'm not like some Italian, ‘hey, Luigi.’ But they just allowed me to bring what I have to offer, and then we can shape it from there. Were you a crazy video game kid? Not crazy. It's so funny. Even when I think back to my childhood, yes, I did play video games, but I'd get so frustrated when I wouldn't win. Not that I would pitch a fit or nothing, but I'm like, well, I'm clearly not good at this. This is not my destiny. So let me go try to be funny. We did have an Atari 2600, and of course, all three of us would fight over which game we were playing. You have such a distinctive voice and that comedy style. Did you develop all kinds of different personas for auditions and sketches? Not so much! Between living in Chicago and New York and Los Angeles and growing up in Georgia and sounding like this pretty much all my life, it was sometimes a challenge to convince people who were casting things that it was okay to sound Southern. I could always try to put on different accents or whatever, but to limited success. And then the cool thing about being able to do ‘Talladega Nights’ or ‘30 Rock’ is that’s what the role required: a polite, Southern person. It's like, ‘I'm your guy!’ So it is interesting to be told after so many years, ‘Don't be like that. Don't be like that,’ to, ‘Oh, no – Please be like that.’ It was refreshing.